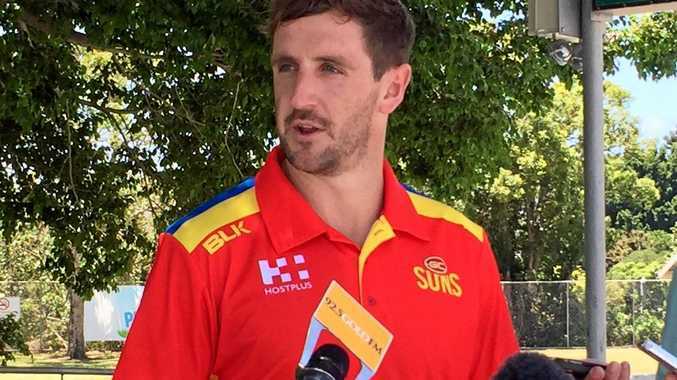 Gold Coast Suns recruit Michael Barlow talks to the media on Friday. AFL: It's a case of better late than never for Michael Barlow. The midfielder was overlooked by the Gold Coast when first forming its list in 2009. He had enjoyed a breakout year in the VFL, winning its best young player award, but the Suns plumped for fellow state stars Daniel Harris, Michael Coad, Sam Iles, Roland Ah Chee and Danny Stanley with the first five selections in the rookie draft. None of those players remain at the club. Barlow went at No.8 to Fremantle but, now 28 and no longer wanted by the Dockers, the Suns, in desperate need of midfield experience, finally came calling. Barlow played 125 games with the Dockers after becoming an instant success - no player has racked more disposals in their first 10 games. But despite still having a lot to offer as a ball-winner, he fell out of favour with coach Ross Lyon. A chat with former Sun and now Docker Harley Bennell helped convince him to relocate to Queensland. Barlow trained with the Suns for the first time on Friday after signing as a restricted free agent last week. "I think, for me, I have been in the footy bubble for seven years now and specifically this year it did become suffocating and at times overwhelming,” he said. "I had a good chat to Harley about what it is like here and there is a good balance of being able to commit as fiercely as you can as a professional athlete but you can step away from it also at times.